Paddling a kayak and fishing at the same time is kind of like taking pictures at your best friend’s wedding: there’s too many things going on at once and you don’t know what to do with your hands. Fishing is supposed to be a brief moment of calm in the otherwise hectic tropical storm of life. One thing that makes fishing even more peaceful is a pedal drive kayak. The Native Watercraft Slayer Propel 13 is just one of the many pedal drives on the market today, but it also happens to be one of the best. There’s a reason that Outdoor Life ranked this the best pedal drive kayak in 2017. Read on and we’ll tell you why we concur. First and first mostly, you’re going to want to hear about the pedal drive system in the Native Slayer Propel 13. While Hobie engineered the first foot-powered drive system, Native Watercraft developed the first that uses a propeller. This drive operates much like a bike. To go forward, you turn two pedals attached to two cranks around and around in a circle. This spins the propeller and off you go. To reverse (a feature only recently introduced in Hobie models), simply spin your feet in the opposite direction. Nate of the BeyondTheBounds YouTube channel explains how, with a non-reversible pedal drive system, a fish can easily spin you around and get you caught in the mangroves. The pedal drive really allows the Native Slayer Propel 13 to hold your position when you have a lunker on the line. Native Watercraft still has Hobie beat in one area: you can actually use the pedal drive to brake by simply holding the pedals in place. There are obvious advantages to this if you’re cutting through a windy creek or fighting a fish. On the other hand, the Hobie will definitely track better if you want to build up some speed and then float forward, but this behavior is rare at best. Unlike most other pedal drive systems, Native’s is completely enclosed with a container of anodized aluminum. It is generally one of the tougher and sturdier models for this reason if you foresee voyaging through shallower waters. It is also designed such that, should you scrape bottom, the prop should protect the propeller from a direct hit. Taking it in and out is easy as pie, and you can also replace it with a small motor (although you’ll need an additional inlay piece from Native). Depending on how loaded up you are, the prop extends 12”-18” below the surface of the water. Some folks don’t like that feature so much, but others could care less. As YouTuber Keep It Bent! explains, one main aspect of the pedal drive in the Native Slayer Propel 13 is that you can’t take it apart with standard tools. To take it apart and service it, you’ll need a special set of tools which will almost definitely run you over $50. That said, Lou Martinez from BeyondTheBounds says the pedal drive can really take a beating. The only maintenance he has ever done is to put some grease inside. While some kayaks only have a couple molded rod holders and mounts, the Native Slayer Propel 13 is positively swimming in rails. Rail tracks extend almost the entire length of the vessel on either side and are intended to hold most kayak fishing accessories. There are also several holders molded into the hull. The one immediately beside the captain’s chair is tilted so you can stick your rod in and easily change lures, untangle, or re-tie. It also doubles as a cup holder. Two other vertical rod holders sit on either side immediately behind the chair. For the cherry on top, there’s a mount on top of the pedal drive system which can easily hook up to the transducer scupper. This is a great place for your fish finder display. The captain’s chair is hand stitched and ultra-adjustable. We haven’t met an angler yet who can’t get comfortable in it. Let’s start with the specs. The Native Slayer Propel 13 is 13’2” long and 33” wide. Now that second piece of information is kind of interesting because the Slayer Propel 10 is actually an inch wider. This has implications for balance and tracking through the water and we’ll get to that later. It has a weight capacity of 500 lbs, a full 100 more than the 10 footer. Unrigged, it weighs 89 pounds. One of the major pros of the 10 foot model is that it’s light enough to hoist up on to the roof of a car for easy transportation. But when you get above the 80-pound mark, you’re getting into new territory. There are a good many anglers who will have no issue loading this on a roof rack. Others, however, are going to want to equip themselves with a trailer. The prop of the propeller drive extends down 13” “below the beam” as the company puts it. You definitely don’t want to hit bottom with this guy. If you can walk through the water where you’re pedaling and keep your knees dry, you probably want to raise that prop and get out your paddle. When it comes to hull design, Native engineers prioritized stability and toughness over speed. And why indeed wouldn’t they? You’re not going to enter this vessel in any regatta sprints. If you flip the boat over, you’ll notice a concave section around the middle stretching toward the stern. This design feature does two things: it slows the boat down and it makes it a heck of a lot more stable. Think about how tippy canoes are. Those boats have a very convex, rounded bottom which makes them great for quick turns, riding well through the water given their size, and hauling a lot of gear. But lean on a gunwale, and you’re going over. As described at length in our review of the Slayer Propel 10, the smaller model is incredibly stable. It’s stable enough that, barring an inner ear issue, most people will be comfortable standing up to sight cast in it. It’s not easy to measure, but we feel the Native Slayer Propel 13 to be roughly equivalent in stability perhaps beating the 10 footer by a small amount. With the Slayer Propel 10, one of the main criticisms is that it doesn’t track very well through the water. Just take a look at the hull profile and it isn’t difficult to see why. The kayak is significantly more bathtub-shaped than, say Native’s Manta Ray. The Native Slayer Propel 13 foot model, however, is more streamlined. It’s actually narrower than the 10 foot and certainly tracks better through the water if you’re pedaling a mile or two to reach your hole. If the poor tracking alone kept you away from the 10 foot model, then the 13 footer should do the trick. Finally the rudder system is unfortunately the Achille’s heel of this kayak. It is probably the most complained about feature of the Slayer. The issue mainly is that you can’t full retract it into the protection of the hull of the boat as you can with Hobie craft and it’s not top mounted (and retractable above the water). If you have to do any dragging, therefore, you’re going to beat your rudder up. Cables have also been known to snap. The pedal drive is stellar in several departments. It can be used to go forward, backward, or brake and hold position. It’s self-contained, sturdy, and comes with a two-year warranty. It tracks much better than the 10 footer. The rails system has a whole lot of track and can accept most accessories. The storage does not leave you wanting. It’s barely a con, but the hull design is blockier than some kayaks and doesn’t move as efficiently through the water. While it leads to greater stability, it makes pedaling a little more difficult. You need a special toolkit to service it. The rudder design is a common complaint. Since we mentioned it earlier, the Native Watercraft Manta Ray Propel 12 is a pretty good place to start. The two have the same captain’s chair and pedal drive. They differ only in hull design. Where the Slayer is more blocky and stable, the Manta Ray cuts a much finer figure. Though the same width, it tapers down to fine points in the bow and the stern. This makes it lighter and much more efficient to pedal, but it also makes it more tippy and significantly reduces the amount of storage and the max weight capacity. Another good comparison would be the Old Town Predator PDL. These boats have very similar shapes: they’re the same width, have the same weight capacity, and stack up pretty evenly when it comes to tracking through the water. The Predator is wider, weighs about 30 lbs more and costs a few hundred bucks more as well. We also don’t trust the Old Town pedal drive system as much as Native Watercraft’s. See our Old Town Predator PDL Review. 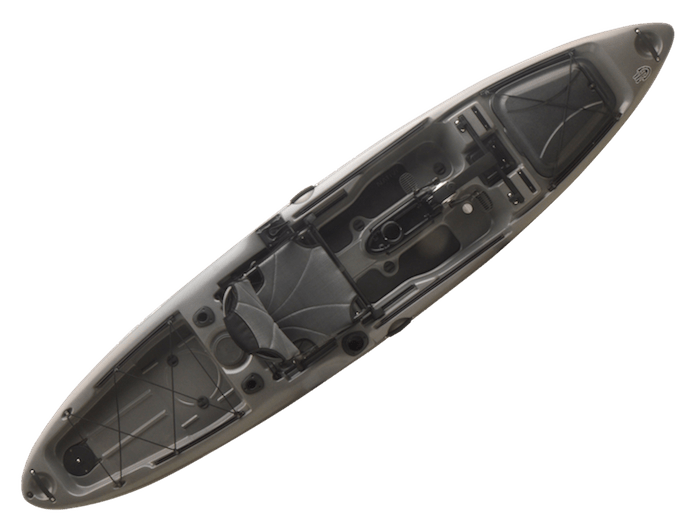 If you like to take your pedal drive kayak out for several different kinds of fishing, we really can’t recommend the Native Slayer Propel 13 enough. While it’s heavier, it more or less solves any of the less-ideal design features of the ten foot model and brings more to the table. All things considered, it is quite reasonably priced.